Single Disc Grinder Rental – Edco SEC1.5L , is available for rent in Rochester NY, Ithaca NY and the entire Western New York region from the Duke Company. Contact the Duke Company regarding Single Disc Grinder Rental – Edco SEC1.5L, available in Ithaca NY, Rochester NY, and Upstate NY from the Duke Company. 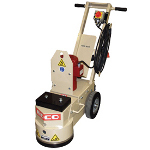 Edco concrete grinders provide the results that professionals seek. The Electric powered, single disc floor grinder is capable of grinding approximately 200-250 square feet per hour at 1 / 32 of an inch. EDCO Grinders – Proven in over 50 years of use. Accept no substitute! The 25 foot power cord enables a wide operating range.